In Brazil, with the cheer of worshipers, a monstrance containing the Eucharist was brought to the sanctuary. The priest then took over the monstrance and placed it on the altar. 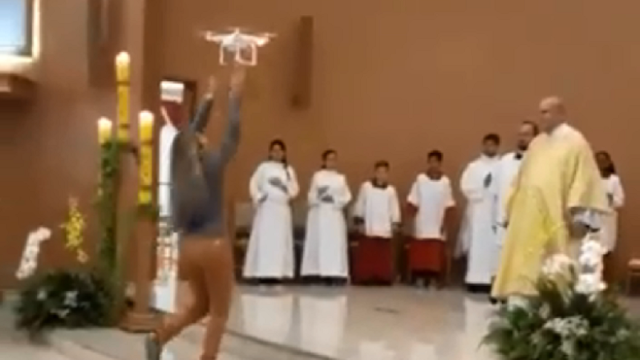 This video was shared on social media In a parish church in the Brazilian city of Sorocaba, during a service, a monstrance was flown down the aisle with a drone to the altar. During the flight, the worshipers were excited and cheered loudly. After the Eucharist, the monstrance briefly hovered in the sanctuary. A short video on the flight appeared on social media and brought much criticism to the parish of São Geraldo Majela. Catholic priest John Zuhlsdorf described the action on his blog as "sacrilegious stupidity". It is nice to work like this with drone.